Launch from the Baikonur Cosmodrome; landing 215 km west of Karaganda / 180 km southwest of Tselinograd. It was the French Mission ALTAIR. During the pass in orbit 4, 19:03 UTC, Vasili Tsibilyev reported all details about the 2nd orbit correction, which was executed during that pass. All went as scheduled. This had been also the case with the 1st orbit correction. Vasili Tsibilyev reported details about this correction as well for during that correction Soyuz TM-17 was out of range of tracking stations. Among the reported data were the times (in seconds) during which the S.K.D. (engines) worked, the gained speed in M/sec, the so called SIRT (fuel consumption in KG) and some pressures in tanks. During the pass in orbit 5 (20:36 UTC) again radio traffic loud and clear. During the next pass the cosmonauts slept. At 22:13:45 UTC Soyuz TM-17 could be seen passing the TCA as a clear star in elevation 39 degrees. On July 02, 1993 Soyuz TM-17 flew autonomously. Following a two day solo flight Soyuz TM-17 docked with the Mir space station on July 03, 1993. 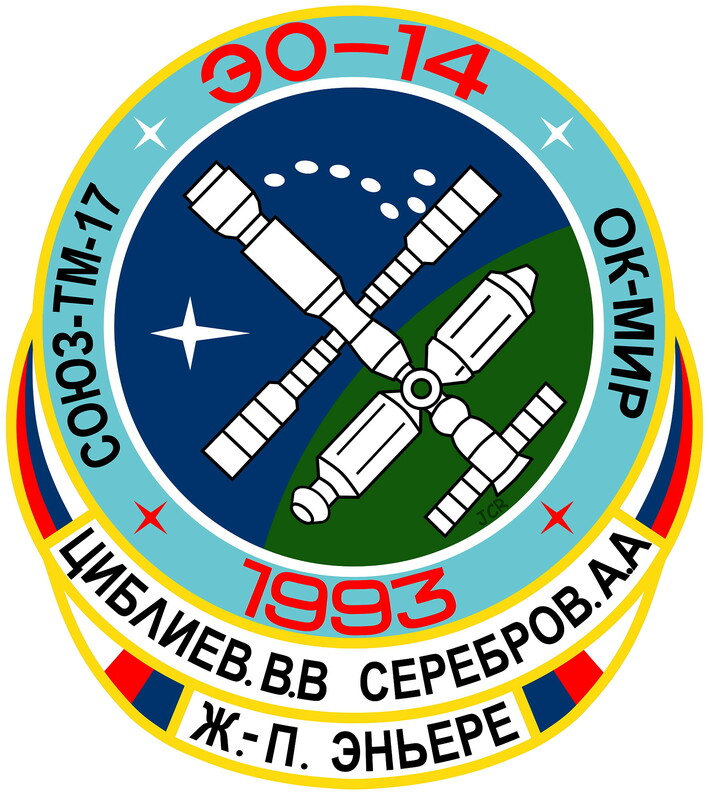 In a unique maneuver on July 03, 1993, Progress M-18 undocked from Mir, clearing the port for the docking only minutes later of Soyuz TM-17 with the Mir-14 crew of Vasili Tsibliyev and Aleksandr Serebrov. For the next 20 days the crewmembers performed common scientific work with the 13th resident crew. 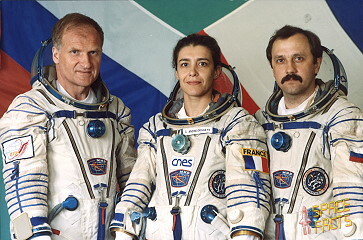 After returning to Earth of the 13th crew (together with Jean-Pierre Haigneré), Vasili Tsibilyev and Aleksandr Serebrov became the 14th Mir resident crew. They performed experiments in materials science. 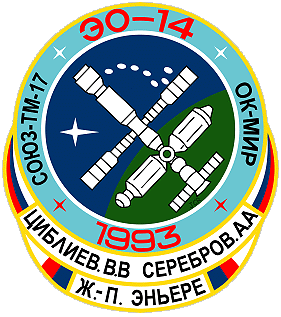 During the experiment 'Rodeo' on July 03, 1993 Progress M-17 undocked from the Mir station while Soyuz TM-17 was waiting for the docking port freed by Progress M-17. Progress M-17 undocked at 15:53 UTC. Soyuz TM-17 docked to Mir at 16:24 UTC. The return-capsule of Progress M-17 landed safely in Kazakhstan at 18:02 UTC. The Mir-13 crew returned to Earth aboard Soyuz TM-16 on July 22, 1993. Progress M-18 remained docked to the station in a systems longevity test. Just after the separation of the Life compartment (BO) and the Motor block from the Landing module (SA) the SA entered the dense layers of the atmosphere at 06:18:17 UTC surrounded by the fire of the plasma. At a distance of approximately 400 km the crew on board Mir was able to observe this through porthole no. 9. At 06:26:55 UTC the main parachute opened and the landing took place at 06:41:00 UTC. So the crew of the Mir-13 crew, Gennadi Manakov and Aleksandr Poleshchuk, and the French 'spationaute' Jean-Pierre Haigneré accomplished their flights. The night of August 12-13, 1993 the Perseid meteor shower peaked. The Perseids occur every year at this time, but in 1993 an unusually high peak was predicted. Because of this, the U.S. delayed launch of the Space Shuttle Discovery, which was scheduled to be in orbit at this time. The Mir-14 crew continued to work aboard Mir, but Russia took precautions: planes and helicopters stood by for the possible emergency return of Soyuz TM-17. During the shower, the cosmonauts mounted an around-the-clock watch, and observed about 240 meteoroids burning up in the atmosphere beneath Mir. They also noted ten window impacts, which produced craters from 1.5 to 4 mm across. Mir impact sensors noted a particle flux of up to 2000 times the normal mean rate during the Perseid shower. Mir sustained no readily apparent consequential damage from the meteoroids, but the Russians decided to mount EVAs to inspect Mir's exterior nonetheless. Progress M-19 with food, water, fuel, post, spare parts, etc. docked to the forward docking port transition section (P.Kh.O.) 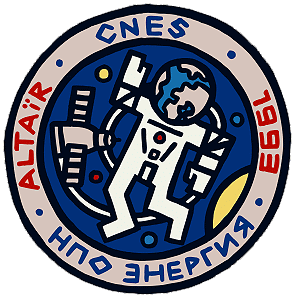 on August 13, 1993 at 00:00 UTC. The operation passed off smoothly and Vasili Tsibilyev reported the hermetic air-seal and the opening of the hatch to Progress M-19. The cosmonauts expressed their gratitude for all what Progress M-19 delivered, but in Aleksandr Serebrov's opinion the Progress M-19 was 'too empty'. He said that only 66% of the cargo-volume had been utilised. Nevertheless he was satisfied about the post, the new paper for the RTTY printer and the renewed instructions for evacuation in case of emergency. The first EVA occurred on September 16, 1993 (4h 18m). The cosmonauts assembled the Rapana girder on top of Kvant. 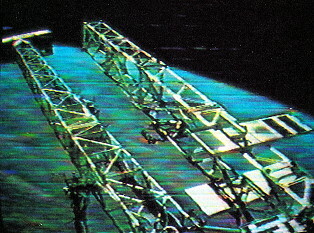 This was a girder assembly experiment with implications for the development of a possible second Mir space station. There was a change in previous plans: so not as expected, the inspection of the outer surface of the complex or the transfer of the solar batteries from the Kristall module to the Kvant1. This time they prepared the installation at the base of the Sofora mast of a truss structure, called Rapana. 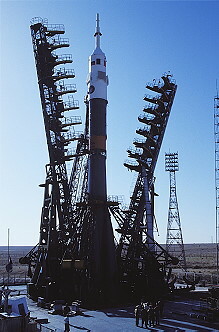 The Rapana uses the design for the construction of support arms, which was planned to use for Mir-2 or for Mir-2's integration in the international station Freedom. The Rapana has a length of several meters and a cylindrical shape. For the installation of this Rapana 3 EVA's are needed. After the installation the Rapana served as a platform for experimental materials to be exposed to the influence of open space. On September 20, 1993 (3h 13m) both cosmonauts performed the second spacewalk completing the assembly of Rapana. The Rapana is standing perpendicularly on the Kvant1 module near the Sofora mast. The Sofora is standing under an angle of 79 degrees and inclines towards the forward side of the complex. The crew installed materials, samples and equipment on the Rapana for an exposure to open space during half a year. After this period the samples etc. have to be returned to earth for analyses. Vasili Tsibliyev and Aleksandr Serebrov went out of the station on September 28, 1993 (1h 51m) for the third EVA. They carried out miscellaneous tasks and inspected Mirs exterior in the first phase of the Panorama program. They spotted a 5 mm hole through one of the solar arrays. The hole was surrounded by an area of cracks several cm across. They had to return early due to a malfunction in the thermoregulation of Commander Vasili Tsibilyev's spacesuit. So they closed the hatch behind them at 02:48 UTC. 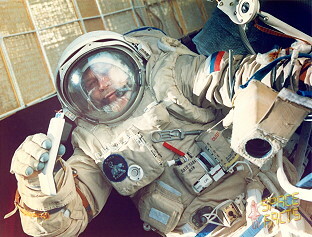 TsUP considered to continue the EVA by Aleksandr Serebrov alone, but 'safety first' prevailed and both cosmonauts concluded the operation at 02:48 UTC. So they could not execute the whole plan for this EVA. Main task was the experiment Panorama, an inspection of the outside elements of the station by photo- and video camera. They partly fulfilled this task. The second task was the collection of the American experiment TREK. Aleksandr Serebrov removed the unit in which samples and materials had been exposed to open space for a long time and brought this back on board. In the near future this experiment will be brought back to earth for analyses by the American scientists. 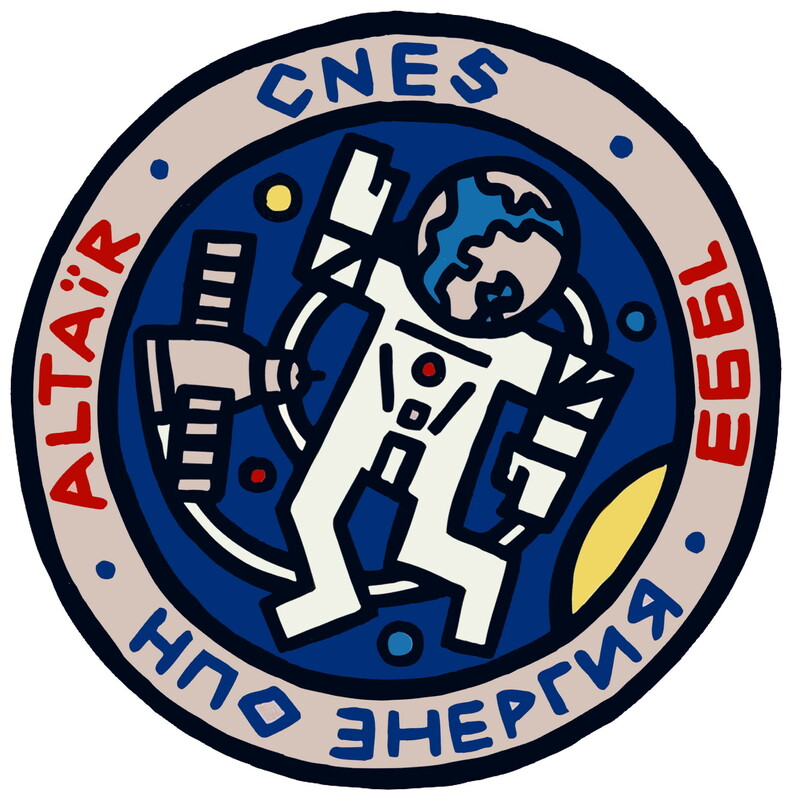 Communications during this EVA took place via Altair and after the EVA at 04:39 UTC Mir and TsUP communicated again via VHF. The launch of freighter Progress M-20 took place on October 11, 1993 at 21:33. Progress M-20 reached the right initial orbit and the first corrections have been executed successfully. Progress M-20 delivered to the Mir station spare parts, food, water, fuel and post. It contained also a package of experiments in the framework of Biokrist. These were protein-crystallization experiments from several countries. One experiment is of Dr. Grip of the Faculty for Eye Surgery, University of Nijmegen (the Netherlands). 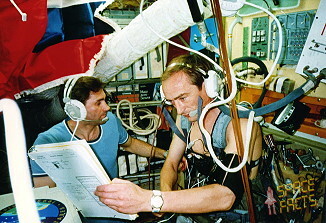 A Biokrist container, including the same Dutch experiment, has been on board of the Mir complex in the first 3 months of 1992. During the transport, after the skilful delivery on earth by the cosmonauts Aleksandr Volkov and Sergei Krikalyov, something went wrong due to extreme low temperatures and the results suffered damages. The present experiment returned to earth by the crew of this expedition. 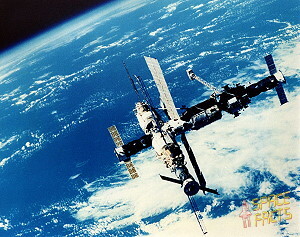 In two days Progress M-20 flew to Mir and docked to the station on October 13, 1993. The approach and docking took place in the automatic mode under observation of the crew. The docking took place a little bit later than expected. The fourth EVA was performed on October 22, 1993 (0h 38m) again by both cosmonauts. They conducted the Panorama inspection of Mir and performed miscellaneous tasks. This EVA ended earlier than planned due to a malfunction of a life system Aleksandr Serebrov's spacesuit. For the fifth and final EVA both cosmonauts left the space station on October 29, 1993 (4h 12m). They inspected Mir as part of the Panorama program and conducted miscellaneous tasks. By the end of Panorama they had inspected the entire skin of Mir. Panorama revealed many small impact sites on Mir, but though no hull penetrations. 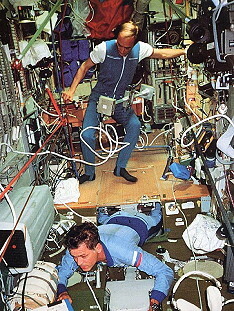 They fully accomplished their tasks: the experiment Panorama, during which Aleksandr Serebrov made video-images of the outer surface of the station, they removed samples of materials which had been exposed to open space and placed new samples and on instructions from experts on earth they carried out an inspection of objects on the outside, for instance the solar panels. They also carried out prophylactic work. Most of the radio-communications was relayed by the satellite Altair. The cosmonauts returned to the airlock and they told TsUP that they were ready to close the hatch on TsUP's command. So they did at 17:50 UTC and they immediately started with the equalisation of the pressures between the airlock and the Instrument-Scientific compartment. On November 21, 1993 Progress M-19 docked to the station. On January 10, 1994 Progress M-19 departed and Mir-15 crew (Viktor Afanasiyev, Yuri Usachyov, Valeri Polyakov) arrived aboard Soyuz TM-18. 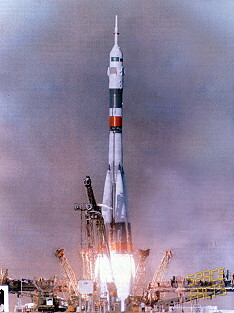 Soyuz TM-18 was launched from Baikonur on January 08, 1994 at 10:05 UTC. The crew consisted of Viktor Afanasiyev, who made his 2nd flight, Flight Engineer Yuri Usachyov and the Doctor Cosmonaut Valeri Polyakov, making his 2nd flight. On January 10, 1994 at 11:50 UTC Soyuz TM-18 docked to the Mir station. Approach and docking took place in the automatic mode by the use of the system Kurs. 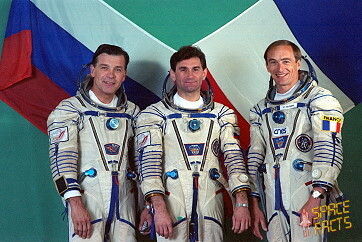 Vasili Tsibilyev and Aleksandr Serebrov boarded Soyuz TM-17 on January 14, 1994 for the return home. 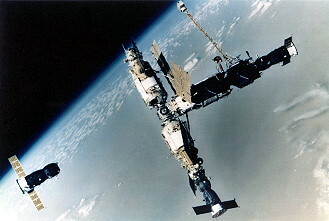 They separated from the forward port of the Mir station. At 04:43:59 UTC, the Mission Control Center in Korolyov (TsUP) ordered Vasili Tsibliyev to steer Soyuz TM-17 to within 15 meters of the Kristall module to begin photography of the APAS-89 docking system. At 04:46:20 UTC, Vasili Tsibliyev complained that Soyuz TM-17 was handling sluggishly. Aleksandr Serebrov, standing by for photography in the orbital module, then asked Vasili Tsibliyev to move the spacecraft out of the station plane because it was coming close to one of the solar arrays. 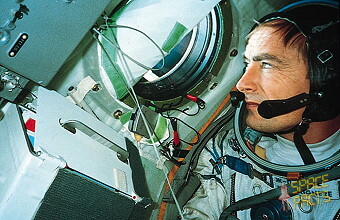 In Mir, Viktor Afanasiyev ordered Valeri Polyakov and Yuri Usachyov to evacuate to the Soyuz TM-18 spacecraft. At 04:47:30 UTC, controllers in the TsUP saw the image from Soyuz TM-17s external camera shake violently, and Aleksandr Serebrov reported that Soyuz TM-17 had hit Mir. The TsUP then lost communications with Mir and Soyuz TM-17. Intermittent communications were restored with Soyuz TM-17 at 04:52 UTC Voice communications with Mir were not restored until 05:02 UTC Inspection of Soyuz TM-17 indicated no serious damage. In this connection, the Russians revealed that they had studied contingency reentries by depressurized spacecraft in the wake of the Soyuz 11 accident. The Mir cosmonauts did not feel the impact, though the stations guidance system registered angular velocity and switched to free flying mode. Later analysis indicated that the right side of the orbital module had struck Mir two glancing blows 2 seconds apart. The impact point was on Kristall, near its connection to the Mir base block. The cause of the impact was traced to a switch error: the hand controller in the orbital module which governed braking and acceleration was switched on, disabling the equivalent hand controller (the left motion control lever) in the descent module. Vasili Tsibliyev was able to use the right lever to steer Soyuz past Mirs solar arrays, antennas, and docking ports after it became clear impact was inevitable. Jean-Pierre Haigneré returned to Earth on July 22, 1993 at 06:41:50 UTC with Soyuz TM-16 spacecraft.